Reveal brighter skin with the Obagi Nu Derm Fx System. Create a brighter, more luminous complexion without harsh ingredients. 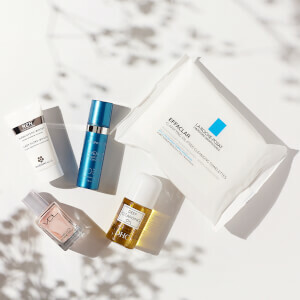 Obagi Nu Derm Fx System for Normal to Oily Skin includes seven hydroquinone-free products that help improve the appearance of dark spots, sun damage, wrinkles and other signs of aging. 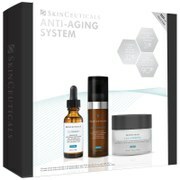 Each product in this system enhances skin clarity and brightness for a more youthful complexion. These formulas also control excess oil and shine. With regular use, this system will help minimize discoloration, wrinkles, rough skin and more. Obagi Nu-Derm Foaming Gel: Purified Water, Sodium Lauroyl Oat Amino Acids, Cocamidopropyl betaine, Sodium Laureth Sulfate, Aloe Barbadensis Leaf Juice, Medicago Sativa (Alfalfa) Extract, Borago Officinalis Extract, Chamomilla Recutita (Matricaria) Extract, Sodium Chloride, Xanthan Gum, Saponins, Phenoxyethanol, Methylparaben, Ethylparaben, Butylparaben, Propylparaben, Isobutylparaben, Fragrance, D&C Red No. 33, FD&C Yellow No. 5. Obagi Nu-Derm Toner: Purified Water, Aloe Barbadensis Leaf Juice, Hamamelis Virginiana (Witch Hazel) Distillate, Potassium Alum, Sodium PCA, Panthenol, DMDM Hydantoin, Polysorbate 80, Allantoin, Salvia Officinalis (Sage) Leaf Extract, Borago Officinalis Extract, Calendula Officinalis Flower Extract, Saponins, Iodopropynyl Butylcarbamate, Fragrance, FD&C Blue No. 1. Obagi Nu-Derm Clear Fx: Water, Arbutin, Cetyl Alcohol, Glycerin, Sodium Lauryl Sulfate, Stearyl Alcohol, Tocopheryl Acetate (Vitamin E), Asorbic Acid, Saponins, Sodium Metabisulfate, BHT, Lactic Acid, Disodium EDTA, Butylparaben, Methylparaben, Propylparaben. Obagi Nu-Derm Exfoderm Forte: Purified Water, Glycolic Acid, Emulsifying Wax, Triethanolamine, Glycerin, Lactic Acid, Caprylic/Capric Triglyceride, Kalaya Oil, Stearic Acid, Cetyl Alcohol, Dimethicone, Methylparaben, Propylparaben, Saponins. Obagi Nu-Derm Blend Fx ingredients: Water, Glycerin, Cetyl Alcohol, Arbutin, PPG-2 Myristyl Ether Propionate, Sodium Lauryl Sulfate, TEA-Salicylate, Tocopheryl Acetate (Vitamin E), Asorbic Acid, Lactic Acid, Phenyl Trimethicone, Sodium Metabisulfate, BHT, Saponins, Disodium EDTA, Methylparaben, Propylparaben. Obagi Hydrate Facial Moisturizer: Water (Aqua), Glycerin, Caprylic/Capric Triglyceride, Butyrospermum Parkii (Shea) Butter, Cyclopentasiloxane, Glyceryl Stearate, Cetyl Alcohol, Dimethicone, Saccharide Isomerate, Stearic Acid, Polysilicone-11, Glycine Soja (Soy Bean) Sterols, Persea Gratissima (Avocado) Oil, Mangifera Indica (Mango) Seed Butter, Hydrolyzed Caesalpinia Spinosa Gum, Hydrolyzed Soybean Fiber, Sodium Stearoyl Glutamate, Caprylyl Glycol, Bisabolol, Allantoin, Tocopherol, Tetrahydrodiferuloylmethane, Panthenol, Carbomer, Hexylene Glycol, Sodium Hyaluronate, Laureth-12, Ethylhexylglycerin, Phenoxyethanol. Obagi Sun Shield Matte Broad Spectrum SPF 50: Octinoxate 7.5%, Zinc Oxide 10.5%. Water, Cyclopentasiloxane, PEG-10 Dimethicone, Pentylene Glycol, Stearyl Alcohol, Phenyl Trimethicone, PEG-40 Stearate, Hydroxyethyl Acrylate/Sodium Acryloydimethyl Taurate Copolymer, Sodium Dihydroxycetyl Phosphate, Citric Acid, Squalane, Ceteareth-20, Polysilicone-11, Dimethicone Crosspolymer-3, Chlorphenesin, Cetearyl Alcohol, Ethoxylated Sorbitan Ester, Xanthan Gum, 1,2-hexanediol, Benzoate, Polysorbate 60, Tetrahexyldecyl Ascorbate, Disodium EDTA, Methylisothiazolinone, Hydrogenated Palm Glycerides, Ubiquinone, Tropolone. Love Obagi best my skin n has ever looked.